Just a week and two days to go to a deep dive into a world of workplace innovation, learning, and digital transformation. 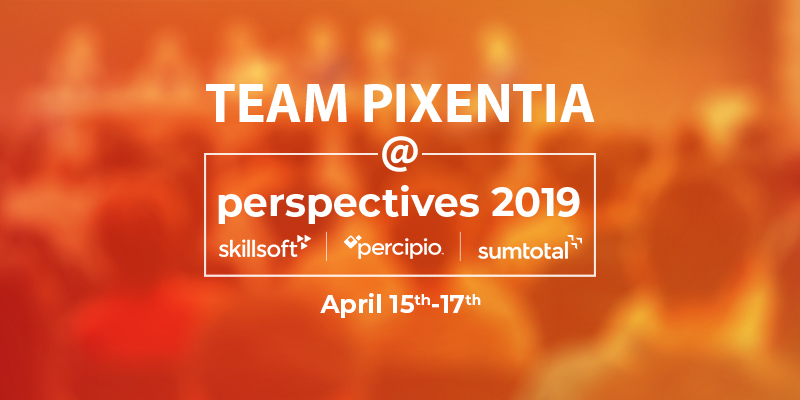 We are heading to Skillsoft Perspectives 2019 this year in Orlando, Florida. Excited to get new insights from forward-thinking leaders and share thoughts on what the future means to all of us and how we can help each other succeed. Stop by and meet our expert team at the conference and talk with us about unleashing the power of the human workplace. Some of your SumTotal® technology or administration issues can be time-consuming, especially if they happen so infrequently that you never seem to develop the experience to manage them. Sign up for a free 30 min consulting session to talk about solutions to your admin challenges. Discuss some of the tried and true practices or craft a new solution for your business needs. Struggling with mastery of SumTotal Advanced Reporting®? Learn how our reporting experts and resources support your day-to-day reporting needs so you can deliver timely information to the people who need it. Create awesome interfaces, engaging dashboards and landing page. Sign-up for a demo to see how easy it is to use our drag-and-drop designer.. Explore Chasma Analytics for SumTotal® and discover our collection of pre-configured analytics, visualizations, and dashboards, designed for SumTotal® Advanced Reporting. Get control of your compliance tracking and reporting. Track your budgets without wrangling multiple spreadsheets. Sign-up for demo to realize the power of SumTotal® Advance Reporting. Learn how you can stop wrestling emails and calendars by streamlining event administration. Make it easier to manage ILT, user group meetings, and workshops. Manage registration, communication, and collaboration in a mobile app. Share collaterals and instructional materials. Integrate with you LMS to transfer completions and certifications to your LMS. See how integrated scanning technology can remove the burdens of manual attendance management. Help your facilitators focus on quality instead of administration. Give your attendees more time for networking by speeding up check-in. Get control of your attendance data. Sign-up for demo to see how you can create a new event management experience. Meet us at the Solutions Showcase. We are easy to spot. We bleed orange.